To start off I will ask you a standard introductory question: Who are you and what encouraged you to start working in the art field? What made you deal with the kind of art that is not taught at academies? While attending the School of Applied Arts, I often visited the Modern Museum and there I gradually learned about the existence of a parallel flow of artistic creation, a line parallel to academic painting. Thus, I chose a few names from these examples and started studying them. Slowly but surely I created a picture, a map or I could say even a world. During my studies of painting at the Zagreb Academy of Fine Arts, the professors already knew what I was interested in and one of the professors stated that there are such individuals amongst us who are doing things that they should do only when they finish their studies. That means that there were strict social rules as to when and with what conditions things are done and this motivated me even more to find the paths outside these narrow frames. And how would you define these paths? I am not interested merely in the fine art scene; I am interested in all media. I started working with video, with installations. I could not even decide to work merely with visual arts. I was also very keen on film and literature. And everything that I did later on was an attempt to merge as many disciplines as possible. And I stuck to this idea to this very day. That is I stuck to the fact that I am not dedicated to a single medium. I think it is always a combination of picture and words that give my personality the greatest freedom to express myself. Then one could say that your main project Author's Newspaper is a sort of an ideal combination of different media? I do not see this project as an expression of the printed, graphic technique, but us an idea environment, within which I can express myself through pictures and words. How did you come across the idea to have your own newspaper? The project is very socially critical, theoretical. From where did you get this impulse, the reason to start it? Are these thoughts dealing with the new relations between the local and global? How would you place the project? To tell you the truth I never dealt with theory or philosophy. If I dealt with philosophy, I would most certainly try to make it easier accessible. This is also the idea that encouraged me to start a newspaper, i.e. I wanted the information to be widely accessible, therefore profane. I think I came across the idea of a newspaper when I was participating in a project in the Czech Republic. The project took place in a huge building, a building with over one hundred rooms. It was a former monastery, even a hundred years ago it was a monastery, then other social institutions, other regimes, times, etc., moved into the building, thus one could find an abundance of 'ideological waste' there. I was working on my project entitled Local Waste. This was a project compiled from articles that various people defined as waste, which I gathered on a cloth. I asked all other participants of this project to bring me waste and help me realise the project. The result was that a part of an old altar, parts of a box used for elections and instruction manuals for protection from nuclear disaster, etc. all shared the same space. On the end this waste operated as a very strong ideological connection junction of all sorts. This encouraged me to think about the confrontation of various ideologies, etc. However, already prior to this I was thinking about a different newspaper. A newspaper is a medium, which experiences inflation and defeat on a daily basis, for it is thrown away. On the other hand I, already as a child, never wanted to throw anything away. At home I had an entire pile of waste, so that this already presented a family problem. I always found the news medium paradoxical. So much time is spent on it to develop it, research it, articulate a certain idea, theme, which in the end finishes in the bin. And the entire civilisation operates in a similar paradoxical way. So, what to do with all the waste? Of course the paper on which the newspaper is printed goes into recycling, but what about the ideas? They also constantly return and are in a way constantly recycled. These are the dynamics that I am interested in and my interest is a result of my waste collecting habit. Do you have any special expectations or a 'point of view' in what way this project should influence people? What do you expect as an author? All comments whether approving or disapproving are reflected in the following edition. It is interesting to observe the psychology of people; the way they react when they see the newspaper is for free. Some take fifteen copies, while others hardly dare to touch it. Most people have the same attitude towards this newspaper as they do to any other consumer goods. I suppose you would never turn towards normal distribution? I suppose not. The catch is that this newspaper is without any value, it is freely distributed and available to the masses. I have noticed that today people have too much of everything. Today nobody has the time or concentration to focus on anything. And it often happens that my texts are commented upon by people who I thought do not read at all. I suppose these people are not art critics or curators? Maybe we could skip to another theme. I am interested in your relation towards the so-called continuity in Croatian conceptual art. Together with Tomislav Gotovac and Aleksander Battista Ilić you have created a project entitled Weekend Art, which Nada Beroš links to Gorgona and so in one of her texts. What is your opinion on this? To me this tradition, this continuity is very important. Even during my studies I found it important to believe that this lineage from, for instance Zenithism to Exat 51 and Gorgona to conceptualism truly exists. I thought it was worthwhile to pay some attention to the study of this tradition. I started writing about this very early on and this thought and experience are certainly reflected in my work. In my opinion the Croatian art scene is very specific due to the transparency of this Avant-garde and conceptual lineage. A very powerful and recognisable school. I agree, even though it is hard to explain this. At a certain stage text written by Mangelos influenced me quite a bit, even though, paradoxically, I found the people of the age of enlightenment, who lived a few centuries ago similarly intriguing, especially their personal correspondence, which of course does not have much to do with the Enlightenment literature as such. These influences and thoughts always intertwine and are reflected in a concrete work in various and unpredictable ways. However, I must say, that the opus of Tomislav Gotovac means a great deal to me. Most probably he is the man who influenced my work to the greatest extent. I think this is because he covers the entire media spectrum. He never worked merely in one medium, he always had an idea, that he expressed through various media. Of course the life of an artist is important. With Gorgona, for instance, it is a pity that some artists later on distanced themselves from their youth. Not all of them. Kožarić remained as he was. How did you come across the idea for the Weekend Art project? Aleksander and I were working for the EgoEas' exhibition. With another three colleagues we initiated this project, which in 1992 was a sort of an overview of new Croatian art. This was the first exhibition following the disintegration of former Yugoslavia, which dealt with the situation in Croatia. Thus, I wrote a text entitled 'Chronology - a short review of Croatian art from 1950 to today' for the catalogue. At this I thought that the work of Tomislav Gotovac was almost unbelievable and of key importance and thus our intense association begun. This became pure friendship. All three of us are passionate film lovers and we realised that we have a lot in common. So, during the weekends we started to visit Sljeme, this is a hill above Zagreb and started photographing each other. We worked all week and over the weekend we became artists, which gave a sort of a sociological component to this project. And what did you discuss during these walks? Mainly films, but also other things. And you never came across the idea of recording these conversations? We did. But then there is the problem of selection, processing and condensing. Already without audio and video recordings we had approximately 800 slides. So you never thought about it in a documentary way? No. Personally I am very inclined to self-censorship, to cleaning up, even when I write. This is also one of the reasons, that I believe and I often state that: 'we can say more on four newspaper pages than through a large exhibition.' I am not interested in the inflation of words or actions. There are already too many words around me. When I use a word, I want it to have the power of a slogan. I think that this is the spirit and psychology of the time we are living in. This is the period of pocket publications. Everything has to be delivered in a straight manner, has to be short and entertaining. In the previous century the psychology of people was completely different. They rode in carriages and read novels. Today the model is a short story or something that can be easily and quickly consumed. This is the reason that I am not a painter or sculptor, for I think that a trace of the period has to exist within the work, not only a trace in the material, but also as a sociologic component. As most conceptual or post-conceptual works of art your work already includes the so-called 'curatorial' dimension. You organise your work yourself. On the other hand curators are today a specific phenomenon and they have great power. What is your opinion of this occurrence, of the completely new figure of the curator-star that emerged during the last ten years? Of course I believe in an equal relationship between the artist and curator and I do not approve of this new tendency that you have mentioned, the tendency for the artists to become some sort of material, an illustration of the curators idea. I prefer it when the artist and curator work together on an idea. If artists are merely an illustration of the idea, what is the point of their existence, why do curators not write books? In your opinion, why do curators not write books? Due to this complex circumstance, i.e. things need to be illustrated, so that they can be brought closer to the general public. This is the line that offers the least resistance. What is your opinion of the new situation in the artistic trends, brought on by the 90's? What is your opinion for instance of the phenomena such as Manifesta or large exhibitions, such as for instance After the Wall, Actions and Positions, i.e. of the tendency that a space without any history and its own institutions is structured with one swift move? Of course there is a difference when you work, I will not say in the West, but somewhere where a market exists, or if you work somewhere that has no market. I have given the idea as to how is it possible to produce a piece of work with a meaning, yet keeping it cheap a lot of thought, and my conclusion is that this can be very tiring. On the other hand this inability to produce such works of art also gives a certain responsibility as well as time to concentrate and not produce and exhibit in a routine manner. In countries without a market, the position of the artist is much more responsible, for the artist is forced to take over the responsibility and judge about things, for there is nobody else who would perform this task instead of him. In such environments artists are in fact the only ones who understand what went on 20 or 30 years ago (apart from curators and theoreticians, of course) thus they have to constantly maintain their visibility. That is why Aleksandar Battista Ilić and I set up the exhibition EgoEast, that is why I write about other artists, and that is why we have recently started with the Community Art project. These are gestures defying the logic that today's Eastern European artist is merely an illustration of this Eastern European artist, merely a statistic, etc. Through the last ten years Eastern European artists have strolled around these large exhibitions, yet at the same time there is little sense in the things that are happening in their surroundings. There is hardly anybody trying to articulate the events in their local institutions, thus everything remains in some sort of confusion. On the other hand Croatia has a very strong informal scene, which in reality creates live production and is organised outside institutions. That is why I think that it is important for every artist to constantly articulate his space. How would you define the boarder between art and activism? I think that such a boarder does not exist in situations without an organised system. In cultures that have an organised infrastructure I think it might even be harder to organise communities in a different way. Therefore, in such circumstances the boarder between activism and art is even more noticeable. Do you receive any financing from the state for your projects? So far I have not received any funds from the state, even though I have kept trying. Does this mean that, whoever exists globally, does not exist locally and vice versa? It still seems strategically interesting, what Branka Stipančić and Tihomir Milovac did with the exhibitions of Ukrainian and Baltic contemporary art and later on with the exhibition The Misfits in the curatorial field. They presented foreign art in Zagreb and then exported these exhibitions or dealt with the local phenomenon and also exported it. Something similar, maybe even more subtle than the projects by Zdenka Badovinac Body&East or the ArtEast Collection 2000+. More subtle in the sense, that they are less ambitious, yet content-wise no less important steps. Absolutely, these are exceptions; such dynamics should always exist and should always be supported. This is the direction local cultural policies should move in. The work on the EgoEast exhibition showed me a certain law of the local community. With the exhibition that we organised in Zagreb, we tried to make a sort of cut on several levels. Aleksandar Battista Ilić was very proficient at gathering funds with sponsors, and I wrote the text, which tried to encompass a sort of historic perspective. I tried to be neutral and objective. It seems as if nobody dares to do this, even today. To be objective, analytical. History is taboo. You always have to think and avoid names. Mentioning names is dangerous. It is a regular practice to mention a couple of friends, and that it is. This is some sort of phenomenon of selective history. I tried my best to write a general text. Such things are not welcomed here, for the local logic is such that you have to take into account and obey that line, which placed you on a certain position, gave you your position. Certain interest networks exist, fields are covered in advance and there is no democracy, expertise, internationalism or even a simple desire to change things. With EgoEast we for the first time directly drew attention to the basis of contemporary art in Croatia. At this we leaned upon Gotovac, Kristl, Mangelos and Kožarić. And this exhibition caused for us to be banished, for we created true hysteria. This of course happens completely spontaneous if you wish to join all the various lobbies, in order to obtain a wider picture. Not really knowing what you are doing. And this was followed by the Weekend Art project which was a sort of recovery from the situation as it is. Can you tell me anything about your new project, Community Art? The idea in Community Art is to combine the ways of functioning, the goal of which is to develop a dialogue between the individual and the community, between individuals and groups and institutions. Works that derive from this idea are often not realised in material and concrete forms. The emphasis lies mainly on the process itself. Community Art is also a school that tries to enable the studies of anything that can not be found at universities. The project is organised on a number of levels, in the form of lectures, presentations, student discussion panels, events intended for the general public or thematically defined public debates such as for instance the 'Paradigm of Conflict'. The emphasis is on the idea of joining art, sociology, activism, urbanism, architecture, psychology, psychoanalysis, anthropology and other fields. The school programme is based on the idea of permanent development of the critical thought, on the idea of sensitising perception and on a holistic approach. One of the most important things in the future is to maintain the intensity of work within the Community Art frame, which continues with its work in autumn. 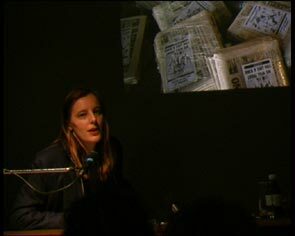 In the year 2004 I am preparing a book as a work of art, which will mainly include texts and images linked to the phenomena of media and media des-information. Then we plan to continue with the project Weekend Art which will experience the parallel of Medvednica above Zagreb also in the woods of Vermont and New York. Mainly everything has something to do with scenarios and that is what is what I find most interesting.